Also works on Windows, Android and iOS. Hide and protect your browsing, banking, online shoping, emails, chats, searches... At home and on public Wi-Fi. Encrypt your connection so nobody sees and tracks what you’re doing online. Not your neighbors, not hackers, not your ISP — not even the government. Simply choose any country from the list of anonymous international servers, and access content as if you were there — and anonymously to boot. What’s a VPN (Virtual Private Network)? 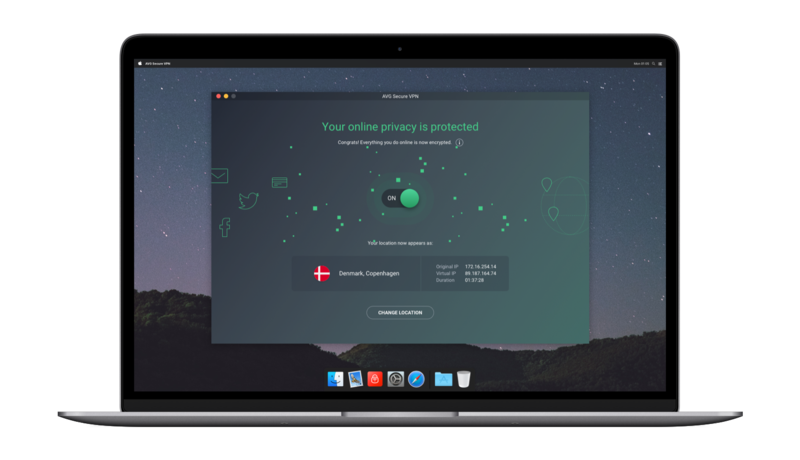 Looking for the perfect VPN software for Mac? It sets up in minutes: download, install, and connect with one click. Intuitively designed with clarity in mind. 256 bit AES encryption grade means your online activity is uncrackable, and you can browse with peace of mind. Automatically halt your traffic if your VPN connection drops, so none of your browsing gets exposed. Choose which networks you’d like to connect to with your VPN, and which ones you don’t — or choose all of them. Up to you. This VPN goes well beyond your Mac: use it on your Windows PC, Android and iOS devices too. Whatever Wi-Fi you connect to - at home or in public - our VPN client can secure it. Launch the Secure VPN app and click on the ON button. Change your location as often as you want. That’s all. As long as you keep your Secure VPN on, your browsing is secure and anonymous, and your location is hidden. Try our 1-device free VPN, and upgrade to a multi-device subscription afterwards. Or buy Secure VPN right now and use it in up to 5 devices simultaneously.